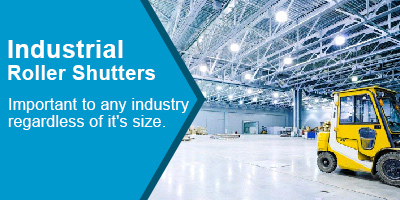 There are well over 50 different curtain slat types that can be used to construct a roller shutter curtain and all of them have different levels of strength, security, insulation and surface finishes available. Steel or aluminium are the 2 main materials for the roller door curtain construction in single and double skinned construction. Roller shutters are strong and efficient and are suitable for a wide range of applications, from small security shutters to large industrial uses. These doors are both economical and robust which makes them one of the most popular types of industrial doors on the market. Up to a certain width and height most roller shutters can be either a manual or electric operation but when you get to a certain size and therefore a certain weight limit the roller shutter will have to be electrically operated and if properly specified it will always have some kind of emergency manual override system in case of a power failure. The range of controls available for operating a roller door are vast and ensure that in a commercial or industrial apllication the very best and safest control can be used for efficient daily use. When used for security purposes you have the choice of very high security access control methods such as finger readers, digital keypads, keyswitches and so on. Alternatively, fill out a contact us form and we'll get back to you as soon as possible. The versatility of the roller shutter door means that options such as polyester powder coating and plastisol parts are readily avaliable on the slats, guides and hood covers making perfect colour co ordination possible. Other options, such as perforated or punched lath, wicket gates (pedestrian doors), wind locking for extra strength and internal/external installations all help make the roller shutter very appropriate for nearly every application. 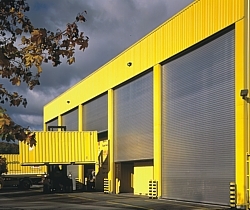 Samson Industrial Doors can supply roller shutters for almost any type of opening, big or small with full CE compliance and a choice in different levels of security, insulation, colours and access control methods depending upon size and application. The curtains produced range from single skinned flat galvanised steel lath through to aluminium, foam filled, double skinned lath with great strength and insulation properties and are all high quality. If you want a roller door based purely on price alone then we won't be able to help you, try Ebay.